Tonight marks the fourth of the forty days before Easter commonly referred to as “Lent.” And I’m not writing a daily Lenten blog….and that feels….strange. I first began the blog site discoverlentwithme.com in 2012 in response to a challenge from a young woman fighting cancer to “do something hard – something you’re pretty sure you can’t do” to stand in solidarity with her as she found the courage to undergo treatment. Thinking of something to write about for 40 straight days – and then posting it for the world to see – seemed to fit the “pretty sure you can’t do” criteria, and so it began. I wrote another series of 40 days in 2015, a year following Kelsey’s accident that changed all of our lives. Daily I sought God for a word – a thought – a hint of something that might be useful or meaningful first of all to myself, and then hopefully to anyone reading. It was a transforming and powerful experience as day after day God came through and met me in some very hard places with hope and healing. Then in 2016 – less than a year after the loss of our son, Brett – I once again found myself blogging through the days of Lent. This time it wasn’t as much to encourage others as it was for my own personal spiritual survival. I was lost. I was lonely. And I was oh so desperate to feel God’s presence and guidance as I daily sought – and many late nights all out fought – to hear His voice and find my footing. And you know what happened? Once again, He showed up. The God of heaven and earth, the creator of all things and the savior of the entire world – met me in the dim light of my Dell laptop night after night as I cried out to Him for hope – for healing – for some word that would get me to the next day. So, once I became reconciled to the idea that writing this year wasn’t the best idea, that left me wondering just how I was going to observe this time that has come to mean so much to me. After spending some time thinking of things to “give up” or things to “add to” my life for 40 days, nothing seemed to feel quite right. So as I was out for a long walk recently I was asking God what He would like for me to focus on for this season and my mind kept wandering to the future and what might – and might not – happen to my little family and myself. Then I would shake my head – pick up the pace – refocus and ask God again for an idea for Lent. Again, I felt the anxiety and fear of the unknown creep into the deepest places of my heart and interrupt all the great intentions of my “what do to for Lent” prayer! Ever been there? So, there you have it. So often my mind and heart race ahead to all of the “what if”s and before I know it my heart is pounding and fear has taken me to ridiculous places that I know God doesn’t have planned for me. But when you’ve lost much you worry about losing more – about the other shoe that feels destined to drop – and it’s so easy to let fear rob you of peace. So, though I don’t know how exactly, I’m committed to at least try. That’s all God wants. Just to try – to come to Him first with my concerns about family and future and faith….and to trust Him. And so, I’m giving up fear for Lent. For the remainder of these 40 days whenever I feel that familiar dread come creeping into my head and heart like an unwanted pest I’m going to grab it, hold it up to God and let it go. Faith over fear. Trust over anxiety. Peace over chaos. It was God’s idea….so I leave it to Him to supply what I’ll need. Oh, friends….life can be so hard! But God knows….He’s been there before us and is with us and goes beyond all the suffering that ever has been or will ever be. He really does love us and wants to teach us a better way to navigate and overcome. Will you join me? 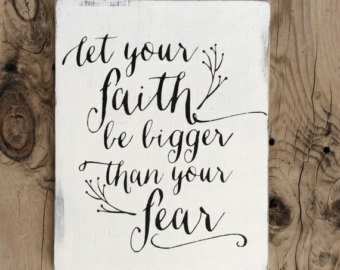 Let’s let our faith be bigger than our fear! This entry was posted in Uncategorized and tagged 40 days of faith, Dare to believe, faith, faith over fear, fear, grief, healing, Hope, lent, loss, mercy, mourning, not alone, steps to healing. Bookmark the permalink.